Preparations are being made for the 2012 Henderson Farmers Market season which will run from June 5 – August 28. As in past years, the Henderson Farmers Market will take place on Tuesday evenings from 5-7 p.m. in the Henderson Downtown Park. Anyone interested in being a vendor at the Farmers Market is asked to complete the 2012 Henderson Farmers Market Vendor Information Form prior to May 1. This form must be returned to the Chamber in order to be listed in the Farmers Market Brochure which will be inserted into the Henderson News at the end of May. The fee for vendors to participate in the Farmers Market is $10.00 for the entire season or $2.00 per week. Vendor Information Forms are available at the Chamber Office or through the link below. Meals served at the Farmers Market will once again be open to any non-profit organization or business with a licensed kitchen. There are currently two meals available on a first-come first-serve basis. If your organization is interested in serving one of these meals, contact the Henderson Chamber of Commerce as soon as possible at (402) 723-4228 or hchamer@mainstaycomm.net. All organizations serving meals will also be listed in the Farmers Market brochure. 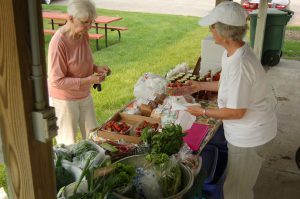 We are planning to have a great 2012 Farmers Market season in Henderson and hope you plan to support the Farmers Market by being a vendor, serving a meal, shopping each week or eating at the Farmers Market each Tuesday from June 5-August 28. For a Vendors Application, click here.